If you have ever been curious about felting, this is the project for you. Worked in double crochet stitch, it uses basic skills and is sure to be a success. 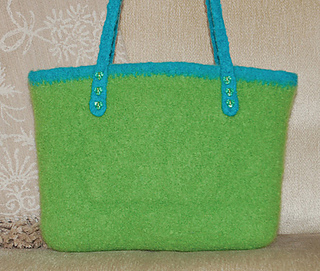 Complete felting instructions are included with the pattern as well as a stitch guide. The interior of the tote is beautifully designed, with an inside pocket, a cell phone compartment and a key ring attachment. Use a contrasting color yarn for the handles and trim, and you will have enough yarn to make a second in a reverse color scheme. This practical bag with decorative buttons that secure the handles, will soon become an indispensable accessory. In fact, we dare you to stop at just one!